Little Brother: find out what you have to lose. Earlier this week my wife was reading a book by Cory Doctorow. She showed me a note inside the book, which said something like “A free download of this book is available under the creative commons license from the website.” Having recently got a Kindle ebook reader, and having no money, this seemed like a good idea and so purely by chance, I ended up reading Little Brother by Cory Doctorow. Before I write a proper review of it, all I can think to write is GO AND READ THIS BOOK RIGHT NOW. The book tells the story of a teenage boy that is swept up the the US Department of Homeland Security in the aftermath of a terrorist attack. Imprisoned, mistreated, then released without charge, he tries to return to normal life but notices the authorities turning his city in to hell in the name of fighting terrorism. This is a story about fighting for freedom, fighting for a normal life, and fighting against government authorities undertaking horrific acts all the while imagining that they are doing the right thing. So many aspects of this book ring true. Teenagers and kids getting fed up with government. 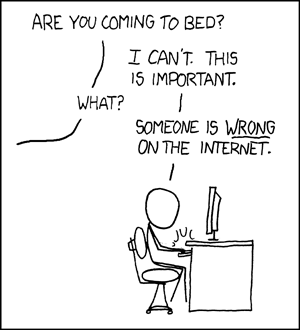 The use of the internet to organise things. Personal video recordings showing things that the mainstream news media does not. The scenes where riot police used CS gas on a crowd of hundreds of teenagers were just a little too possible for comfort. If you are disillusioned by the current state of affairs, read this. If you are not, read this and then ask the question “how far are we from events like those in this book?” Little Brother is essential reading to find out what you have to lose. You can get this book, and others, free of charge from Doctorow’s website. If you don’t have an ebook reader then there are a vast number of ereader apps for phones and computers. I can suggest Calibre if you are using a PC. Oh, and if you like the book, go and buy it. Prove the authors theory on copyright correct. Author LatentexistencePosted on 28th November 2010 28th November 2010 Categories Politics, ReviewTags abuse of power, book review, freedom, politics, protest1 Comment on Little Brother: find out what you have to lose. Operation Trashvote: a solution to bad government? It is clear that the main parties lie to get in power and then renege on their promises, and with the current voting system (First Past The Post) there is little chance of electing smaller parties or independants. The solution may well be proportional representation but MPs are unlikely to support that if it means they might not be re-elected. Voter turnout at the last election was 65.1%. I know of an awful lot of people that will not vote in elections because they think it’s pointless. I disagree with that. Refusing to vote is seen by the goverment as apathy. Spoiling the ballot paper, on the other hand, is actually counted and reported. Here is what I propose. At the next election, if you were not going to vote, go in anyway and spoil your ballot paper. Moreover, everyone should spoil it in the same way. The ballot papers will be destroyed, but the people doing the counting will notice the pattern and might say something. Yes, you still need to register to vote. No, it won’t help choose the government at the election. What it will do, is gather clear statistics on just how many people are unhappy with the current system. I am proposing to call it Operation Trashvote. It would need a large campaign, starting on social media but then spreading out via the news media, protests and publicity stunts. The campaign should start as soon as an election is announced. (Hopefully sooner rather than later, if the coalition breaks down.) It will only work if hundreds of thousands of people go out and promote it. If Facebook can get a song to the Christmas number one, and Twitter can raise thousands for the #twitterjoketrial, then we can do this. Just to be clear, if you were going to vote for a party or person, do it. I think this campaign should be aimed at the people that were not going to vote at all. Make your wasted vote count! Would you support this? Would you be prepared to help campaign for it? Do you think it should be done slightly differently? Comments are open below, so get talking! Author LatentexistencePosted on 27th November 2010 27th November 2010 Categories PoliticsTags apathy, politics, spoilt ballot, vote1 Comment on Operation Trashvote: a solution to bad government? Following the completely unexpected popularity of my blog post about the van at the 24/11/2010 London protests, I need to clear up a few points. I think these things are clear. I saw the sequence of events on live TV and it could be verified if anyone can get hold of a recording. The police started blocking the route several minutes before the van arrived. The van was driven in to the back of the crowd, (relatively thin at this point) pushing protesters out of the way. Some got angry at being driven in to or made to jump away, and pushed or hit, or sprayed graffiti on the van. The police abandoned the van. The bulk of the protesters arrived to find their route blocked and an already slightly graffitied van in the middle of the crowd. 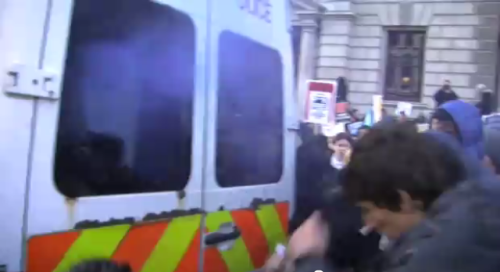 Some (very few) people started smashing the van in spite of attempts to stop them. 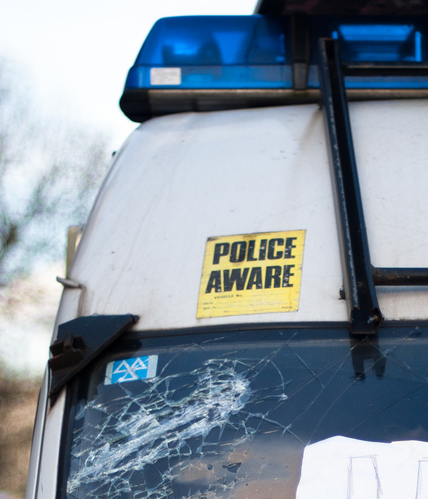 The police justified their use of containment (kettling) by citing the attacks on the van, which happened after they started kettling. The police claim that the van was following protesters to gather information on where they were going. They knew full well where they were going, since they had already blocked the route! There is a possibility that the van was in use by FIT (Forward Intelligence Team, explanation here) to take photographs of protesters. I have received information from a few people that have changed my mind on some of my original points. Actually the van did have number plates on arrival, although there are no clear photographs or videos of it. The best I have seen is this one from ITN. It is painted in the OLD livery of the Metropolitan police. I am told that the police routinely use vans of this age. It has been out of service long enough to get rusty. Several of their vans are rusty, and in fact you can see on this picture that it was rusty even in 2008. We should probably be concerned at the lack of preventative maintenance there. It has a POLICE AWARE sticker on it, that has been there a while. This one was true. 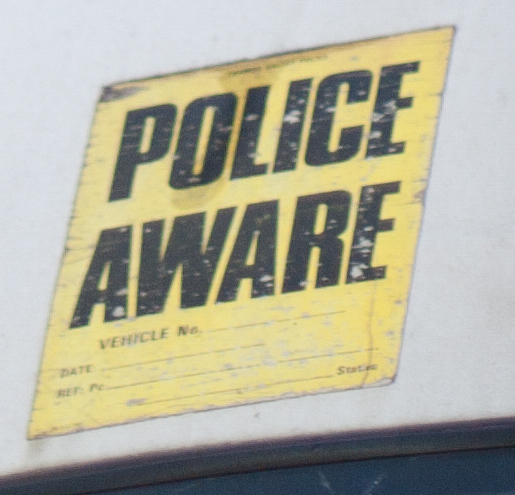 Some people have suggested that the sticker was placed there as a joke by a police officer, or that it was placed there to mark the van for attention by a mechanic. I’m not sure I buy that. 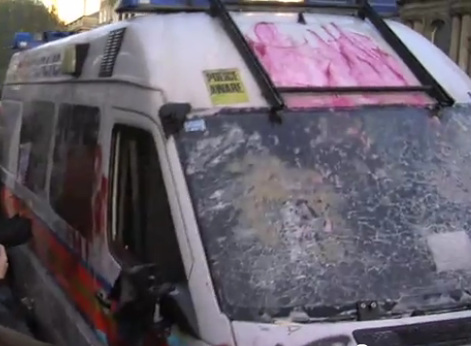 I still believe that this van was planted as bait to incite vandalism and provide an excuse for kettling. The only alternative theory I can think of is that the police are really, really stupid. It could be that I suppose. Sky news video shows van accessible, police standing near it and crowd all calm. Busted! Out of touch? Out of their heads! “For the vast majority of people in the country today, they have never had it so good ever since this recession – this so-called recession – started, because anybody, most people with a mortgage who were paying a lot of money each month, suddenly started paying very little each month. Comments from someone that has never had to worry about finding a job or a place to live. All this adds up to proving that politicians, particularly rich Conservative ones, are completely out of tune with reality, or with what it is like to actually have to work for a living. The solution? Perhaps we should stop voting for millionaires to run the country; it’s like turkeys voting for Christmas. Author LatentexistencePosted on 25th November 2010 8th December 2010 Categories PoliticsTags clueless, insensitive, pathetic, politicians, politics2 Comments on Out of touch? Out of their heads! I love this video. It shows you just how hard the protesters were trying to stop the vandalism, and what their attitude really was instead of how it was portrayed by some news outlets. I feel a sudden urge to link to this picture. I have received information from a few people that have changed my mind on some of my original points. I really don’t consider myself a conspiracy theorist, I just want to correct an injustice and set the record straight. I am not a journalist. I have simply gathered some observations that looked odd to me, and some of them have been refuted. Please read all of the article and the comments and then weigh up the evidence before you decide. During the protests in London today the police stated that they had started “containing” the crowds after they violently attacked a police van. I contend that the van was deliberately planted in order to provide an excuse. At around 12:30 I started watching BBC News which as showing live footage of the protests from a helicopter. The police were already blocking the route of the planned march with a huge amount of vehicles and offices. I watched that van be driven through the crowd from behind, angering all the people that had to jump out of the way. It was quickly surrounded by furious protesters and forced to stop. A little later, a few (unknown) people started to attack the van, trying to break the windows, roll the van over and paint graffiti on it. Some brave kids tried to stop the attacks, but were eventually pushed aside. But there is something really interesting about this van. Jump to 28 seconds in to this video to see what I mean. Look just under the windows. And thanks to @psweetman for spotting this. 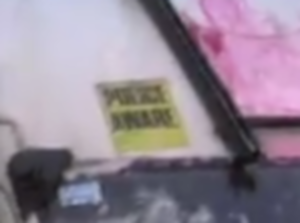 Does that say “police aware” ? Despite all this, the protests were mostly peaceful. In response to Rob W, here is the ITN video. There is a number plate visible at 6 seconds in, although not clear enough to identify a number. The police started kettling several minutes before the van arrived. The bulk of the protesters arrived to find their route blocked and an already slightly gratified van in the middle of the crowd. 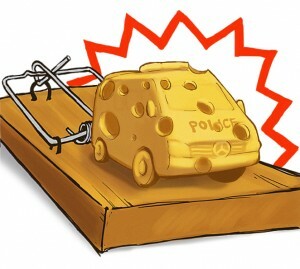 The police justified their use of kettling by citing the attacks on the van, which happened after they started kettling. I have come to realise that the way I think about things has a name. Scepticism. It’s easy to spot sometimes. Internet scams, bogus medicine, bizarre ideas and rumours, I can easily see that I am a sceptic when it comes to those. Generally when something new comes up I use the scientific method to determine fact from fiction. Over the last few months I have been paying a lot more attention to sceptics and scepticism. I follow a few well known sceptics and scientists on Twitter and read their blogs. In the last few days an argument has been brewing relating to the Skepticon convention. They have been accused of being a purely atheist convention rather than catering to all sceptics. It has led several prominent atheists to stand up and say that scepticism and atheism are the same thing, and others have said that they are not the same thing but religion is the most important thing to be sceptical about because of the amount of harm that religion has done. It has also been said that Skepticon is not an atheist convention, with only three out of fifteen speakers talking about religion, although others have claimed that more talks ended with atheist conclusions. Since it is not possible to prove a negative, it is impossible to say that god does not exist. Technically this means that a sceptic that has concluded there is no proof of god should become an agnostic, not an atheist. The justification that has been used for becoming an atheist instead has often been the Null Hypothesis If you have a hypothesis about something, you must come up with the opposite hypothesis, and then test statistically whether one or the other is more likely. For a brilliant explanation involving aliens and socks, have a look here. Atheism can be seen as the null hypothesis, with the existence of god as the alternative hypothesis to be tested. To me, it seems partly a cop out that non-believers would choose to be atheist rather than agnostic, but at the same time I can see how the same concept applies to things like homeopathic remedies or horoscopes. It does seem to be the case that most self-identified sceptics are also atheists. I have had conversations where I have been told that I cannot be a sceptic without also being an atheist. I have to admit to struggling with this idea. Why do I believe in god when I question everything else? I can’t answer that in any acceptable way. I just don’t know. I am left with the option of compartmentalising my faith away from my scepticism, or going with logic and losing my faith completely. I have gone with the first option for months now, but I am consciously aware of the division in my thinking, and not owning an electric monk, the breakdown in logic is causing a lot of frustration.